First Line: A full moon-- a rustler's moon-- peeks from low-hanging clouds and casts eerie shadows across the grassy pasture. It's frustrating when two innocent people are strangled to death on consecutive Saturday nights and you can't convince the police in Cheyenne, Wyoming that there is a pattern and it could happen again. Since the lead detective won't pay any attention to them, TV reporter Ana Maria Villarreal and retired homicide detective Arn Anderson decide to conduct their own investigation. Arn's already got his plate full since he's been hired as a range detective to catch the Midnight Sheepherder who's been rustling livestock from local ranchers, but he just lights both ends of his candle and deals with it. The closer Arn and Ana Maria come to catching the strangler, the more they're met with suspicion, and when they come face to face with a desperate act of violence, they begin to wonder if they're getting close to the solution or close to their own deaths. This two-pronged mystery begins with the Midnight Sheepherder rustling sheep in the dead of night. The scene is so vivid that I felt I was right there in the pasture with the thief and the thief's canine accomplice. The second mystery needing to be solved is, of course, the identity of the strangler. Both held my interest all the way to the end of this fast-paced book, and if I'd paid attention to one of my rules of armchair detecting, I would've figured out the rustling mystery. Oh well... sometimes I get so caught up in a story that I forget all about those rules of mine. Arn Anderson and his motley crew of friends provide both humor and excitement to this second Bitter Wind mystery. He gets along well with Police Chief Oblanski but has a much more difficult time developing a rapport with Slade, the lead investigator on the homicide case. (Probably because Slade is one of these guys who knows he's always right.) But back to that motley crew. Danny Spotted Elk was a homeless man who thought he'd found a home in a derelict house until Arn decided to fix up his deceased mother's home so he himself could live in it. Danny talked himself into staying because he's a first-rate carpenter/plumber/electrician... and not a bad cook either. Arn's saving a bundle on the renovation, getting fed, and finding out that it's much better when there are two smart alecks on the premises instead of just one. Ana Maria's the one who goes out investigating most often with Arn because she gets her TV station to hire him to investigate things. Wonder of wonders, she's a TV reporter with scruples and smarts, not the typical pains in the neck you usually read about in crime fiction, so you don't want to sic the Saturday Night Strangler on her. 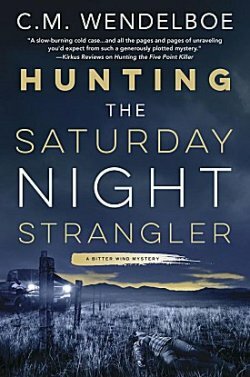 Hunting the Saturday Night Strangler has an excellent double-barreled mystery, laugh-out-loud humor, and some hair-raising action scenes added to a very strong cast of characters. C.M. Wendelboe's Bitter Wind novels are a good way to spend an afternoon or two. I'm looking forward to the next one. I do like the setting for this one, Cathy. And it sounds as though the wit really adds to the story, too. I always respect an author who can add wit without the story becoming too, well, silly. Glad you liked this one. Yes, the wit is one of the reasons why I like Wendelboe's writing.